For when you don't want to know how or when your long wait ends. From the folks who brought you Star Wars in a subway car, come the latest and greatest in guerilla labeling. Jason Eppink, a self-proclaimed mischief maker who says he “engages the public with victimless pranks, urban interventions, and interactive sculpture,” has decided that New York City Transit’s countdown clocks are just too practical. 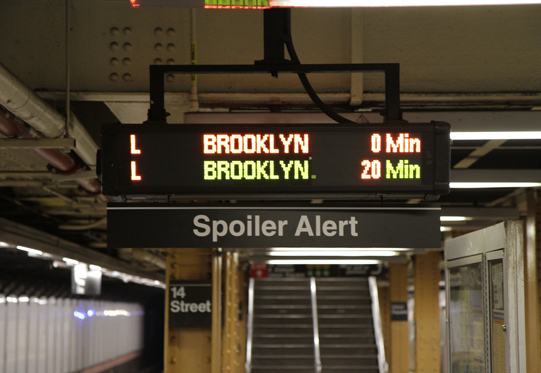 So to restore an element of surprise to the tedious task of waiting for the subway, Eppink has installed Spoiler Alert signs to the system’s signs. I, for one, love the countdown clocks. I find myself consciously taking rides on the IRT lines just so I can enjoy the stress-free experience of waiting with a clock, and even though the clocks aren’t bug-free, they’re right more often than they’re not. I don’t miss that “time-honored New York tradition of leaning over the platform edge” one iota even if, as Eppink notes, it is a distinctly New York thing to do. I’m sure some New Yorkers — and the MTA — won’t appreciate these signs and will find them too subtly sarcastic or cutesy for the serious business of riding the subway. But as the countdown clocks have made riding less stressful, this public art/prank can add a moment of levity to a dour subway commute. Altering public property without permission is vandalism. Also, this is very funny.